HOME DZINE Home Improvement | Load bearing walls: How to tell? Knocking down internal walls can transform your home by turning two or more cramped rooms into one integrated and spacious area. But knocking down a wall – any wall – is not a job to rush into without detailed preparation and expert advice if the work is to be completed both safely and effectively. Before demolishing any internal wall, it is essential to first discover whether or not it is load bearing. Some internal walls simply divide one room from another, do not support loads, and can safely be removed without risk. But others need more elaborate techniques since they support weight from above – the ceiling, any upstairs wall, the floor above, or a combination of all three. Non-load bearing stud walls can be removed without the need for temporary or permanent support of any kind. 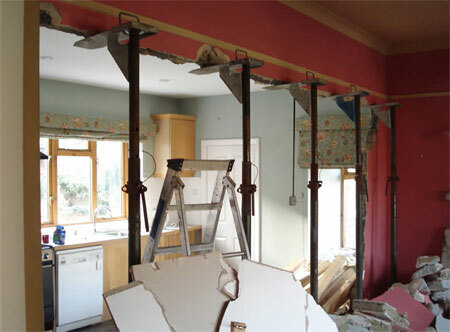 Load bearing walls, on the other hand, must have the weight from above temporarily held up by props while a support is inserted in the wall above the proposed gap. Only then can the wall below be safely knocked down. Finding out whether a wall is load bearing is not as easy as it may seem. It is impossible to tell just by examining the outside of the wall and extensive tests need to be carried out to determine its exact function. These may take a great deal of time and effort, but are essential if serious structural damage or even collapse is to be avoided. Start at the wall you intend to demolish and sound it out by tapping the surface all over with the handle of a hammer. If there is a definite hollow ring, the wall is a stud partition made from timber and plasterboard and there will be “dead” spots that correspond to the lines of the stud framework below. If it is non-load bearing it can be safely knocked down without risk of collapse. Take care though, as some types of stud walls are semi-load bearing, particularly in older homes where they are used to help support light or short joists. If the wall appears solid when sounded out, it is made of brick or some other form of building block. But this itself is no indication of whether or not the wall is load bearing. To find out, examine the area where the wall meets the ceiling joists or roof supports and follow the line of this to the room above or up into the ceiling space. You will find either that the wall disappears, having ended just above the ceiling, or that it continues up through the room you are in. In either case, the only way to determine the purpose of the wall is to lift a number of floorboards to expose the top of the wall and the joists around it. When a number of floorboards are removed, you should get a clear view of where the wall joins the joists and be able to tell whether the wall bears the loads from the joists or not. ABOVE: The ceiling joists sit on top of the wall on the wall plate and serve two purposes: 1] To keep the wall structure intact and to support the structure. The beams are installed after the wall is put up in order to support walls and ceilings. Note: Never take the direction of the floorboards as an indication of how the joists below may run. You may be under the impression that floorboards always run at right angles to joists. But in some cases, new boards have been laid over the original ones to create a more attractive floor, so always lift the floorboards to find out what lies below. Non-continuous wall: If the floor joists run in the same direction as the wall and do not support any roof structure, it will be clear at once that the wall cannot possibly be load bearing. It can therefore, be removed without the risk of the floor collapsing and without the need for a new support. But if the joists cross the line of the wall – and especially if they lap each other – they are likely to be supported by the wall beneath them. In this case, it is essential that they are supported in some other way before the wall is demolished. Before you make a decision, bear in mind that the wall could be a later addition to the house and therefore, non-load bearing, event though the joists cross it. A certain indication of this is that the plasterboard on the ceiling also continues through the wall to the next room. Continuous wall: If the wall you intend to remove continues into the room above, it is bound to be loadbearing. But floorboards on both sides of the wall should still be removed in order to check on the building construction beneath. The exact technique used will determine the width and length of the support needed to carry the weight from above after removal of the wall. When the joists run parallel to the wall, the support need only be wide enough to support this since the joists have their own independent support. But if the joists cross the wall, the support used must be wide and strong enough to hold up both the weight of the wall and the floor. 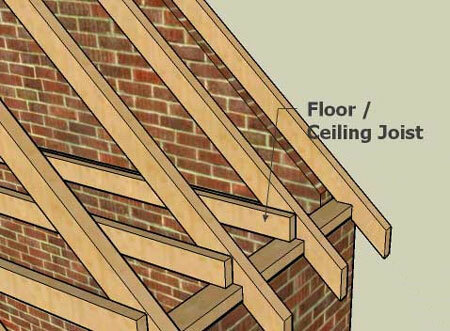 In some cases, the joists stop at the wall and are supported by wall-plates in older properties, or by joist hangers. If either of these are in evidence, the support that replaces them must be wide enough and strong enough to take the weight of the floor and the wall above. There are three types of support that you can use in place of loadbearing walls – pre-stressed concrete lintels, reinforced concrete beams and rolled steel joists (RSJs). 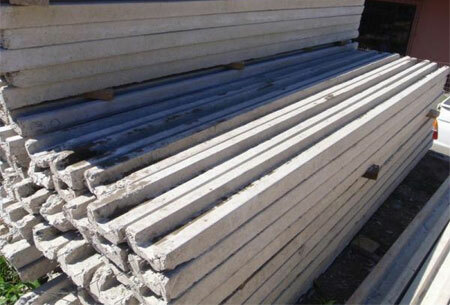 ABOVE - Concrete lintels: These are factory-made from cast concrete, and reinforced with high-stressed tensile steel wire. Concrete beams: These consist of reinforced thick steel rods embedded in a block of concrete and because of this, they are much heavier than pre-stressed lintels. The beams are usually cast on-site. 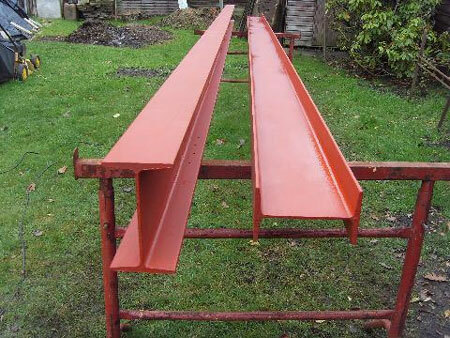 ABOVE - RSJ - Rolled steel joists: In cross-section, this type of support is usually shaped like an “H” on its side and is made in a number of sizes to suit almost any span or load. The type of support used and its exact size must be carefully worked out according to complex calculations and it is most important that you take professional advice on this point from either an architect, a surveyor or a structural engineer before proceeding. It is also important to set the position of the lintel or beam so that the reinforcing rods or wires take the strain correctly. Although many factory-made lintels are marked to show which side should be uppermost, it is not always simple, and again, it is essential to take expert advice. There are three ways in which a support can be inserted to take the weight from above. The first involves resting the support on specially-built brickwork piers that are completed before the wall is finally demolished. Though the job sometimes requires that the foundations be modified or extended to take the load of the piers, this is usually the best way of spanning a wide gap because it can take a great weight. It is rarely necessary for narrow gaps where the piers would look awkward and bulky. The second, and most popular ways of inserting a support is to leave the ends of the wall you are demolishing in place and rest it on these. In this case, the support itself must be at least 300mm longer than the gap you intend to span and must be well secured to take the weight from above. Bear in mind that if you are using his method, demolition may weaken the wall ends and they may have to be strengthened, rebuilt or tied in to adjacent walls. The third method – demolishing the wall entirely and resting the support ends in the adjacent walls – gives by far the neatest finish, but is not always feasible. To give adequate support, the walls must be cavity walls or at least boast a double thickness of brick. In the former case, the supports then rest on the inner leaf, but in a solid wall it is not always possible to insert far enough to do the job. Whatever support method you may think you need to use; it is essential to take expert advice before you go any further. An experienced architect or surveyor will be able to assess what is the simplest and safest method just by inspection, as well as providing important information on the size of support required.